I decided to go to track on Monday as it seemed to be the least hellish weather forecast for the coming week. The session was 8 x 900 with the first 300 tempo then the last 600 faster. As Rick wasn’t there I have no idea of consistency or pace. My group was one in name only as there must have been a good 50 metres between us. No matter. I just wanted a steady session and I feel it was. 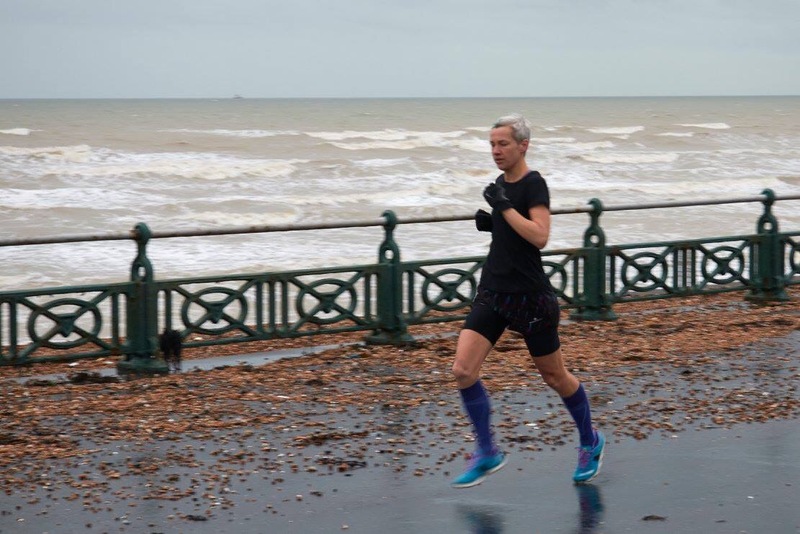 I was still suffering general knackeredness post speedy parkrun so decided on a recovery run on Tuesday morning in the hope it might set me up for a successful evening session in a hellishly windy Hove Park. 3 miles of drudgery. Hard work and too windy. The evening session question was the worst of Tom’s inventions. 3 x the hilly horrid 2 mile route. I wanted to be steady and consistent. I managed 14.16 and 14.15 for the first two but struggled on the last and only managed 14.29. My legs were tired and the wind had picked up quite a bit on the homeward stretch so it wasn’t too bad (she tries to tell herself). On Wednesday it was time for another LSR. The weather was pretty horrid. Cold and windy to start with, then towards the end it started raining horribly too, just as the point where I leave Rob and have to turn back into the wind for the homeward 3 miles (just measured it on RunKeeper and it really is 3 miles). I was by now totally knackered after 5 solid days of (mostly hard) running so managed to be very sensible and not run until Saturday. The weather forecast was a massive stinking LIAR! It said 11mph winds so I thought I’d take the opportunity to go to the prom as it’s so much easier to get to than Preston Park. I decided to try a new tactic of arriving just before the start to see if a cycle warm up is any good. Alas it was hard to tell if it was or not because it was SO WINDY it was nigh on impossible to run in westward bound direction. Bum. I think I must sue the BBC weather app immediately. I tried to make the most of it but even trying all the way the wind was too sapping and I only managed 21.46. I am truly terrible at running into the wind. However I was finally first woman over the line so that’s something I suppose. Huff. This morning it was the Worthing Lido 4. I hadn’t been looking forward to this as it contains a horrible muddy section… but no! 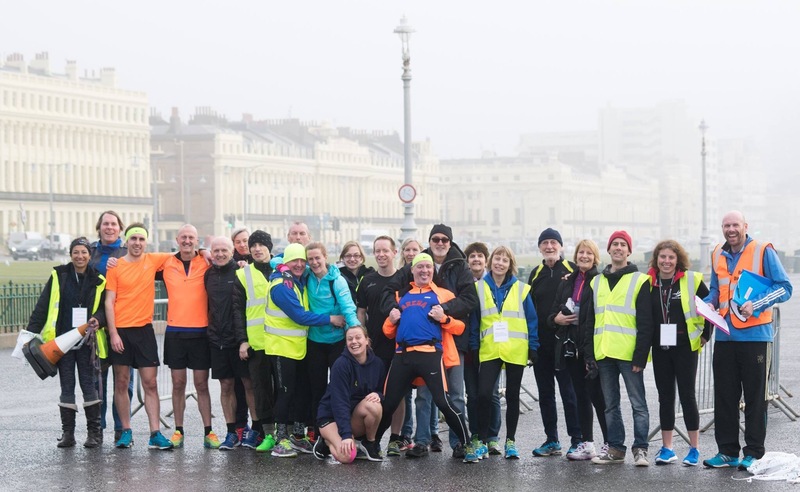 They changed the course as the field was waterlogged which meant it was a slightly longer, two lapped course all on the prom. Yippee! Ages ago I had decided this would be a target race where I wanted to run under 27 minutes (obviously this was planned on the original course). Due to the wet, cold and windy forecast I knew it would be difficult but I wanted to at least give it a go. On Saturday evening I decided I’d follow Juliette (even though I didn’t know if she was even running it). She was there! Off we set. I managed to keep with her for the first 2.5 miles or so but then the stupid wind got to me and I faded a bit. I was still further up the field than I have been in a long time with Juliette, Caroline and Paul all still just about in sight on the homeward mile. No official time yet but I reckon a few seconds over 27 minutes so that’s acceptable given the conditions. It was very windy but not as bad as yesterday’s parkrun, but it was equally cold and much wetter. Anyway I’m taking it as a successful accomplishment of my first target. Only 31 miles for the week but an acceptable end. 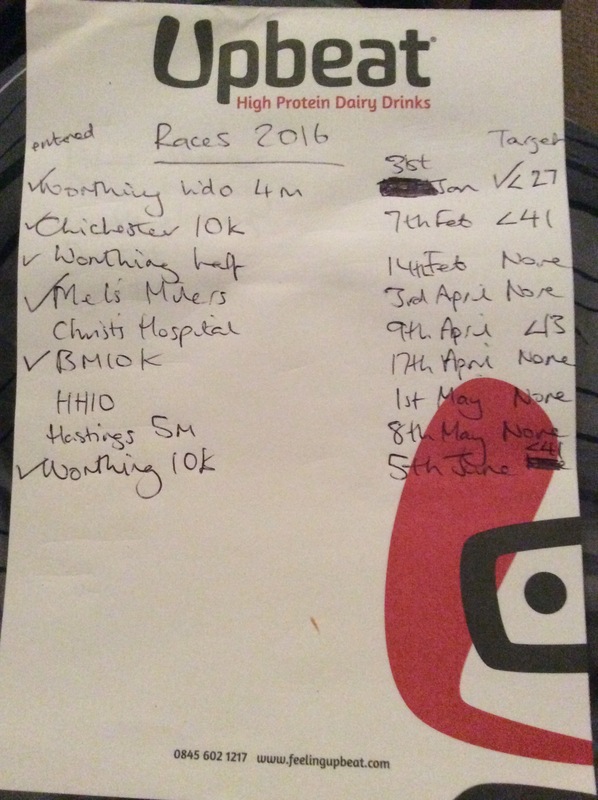 After a 60 mile week I thought I might try and be sensible so didn’t go to track. The sensibility was helped because it was utterly freezing so I thought the track might be frozen off so didn’t want to chance going over only to find we had to go to Preston Park as I find it just the wrong kind of darkness to run without fear of tripping over. On Tuesday it was still very cold but sunny and not windy so perfect for the usual 10 mile loop with Rob. One must make the most of these sorts of day seeing as the weather generally wants to be a terrifically windy and rainswept affair. In the evening it was back to the seafront for a repeat of Tom’s session of 4 x 2.5k. The weather was perfect. My sock and legging combo not. 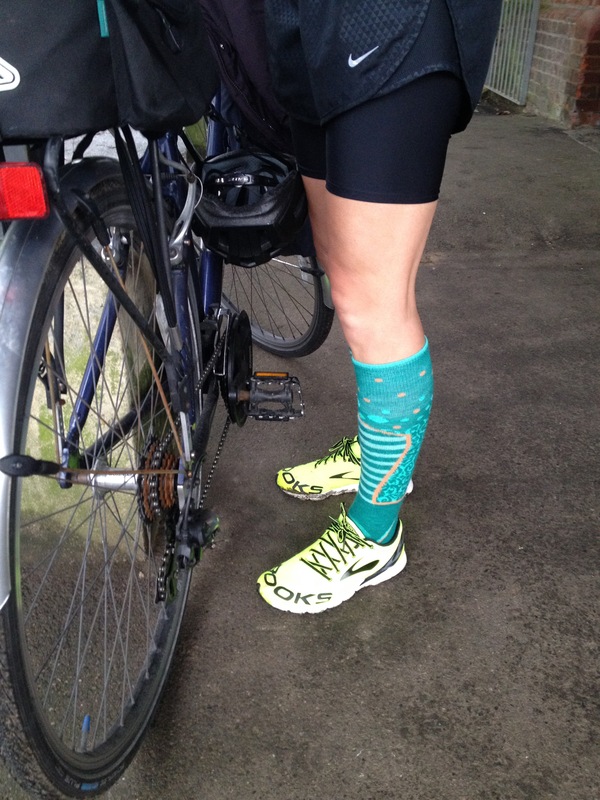 The socks fell down almost immediately making me look like someone doing aerobics in the 1980s. Luckily this fashion faux pas didn’t affect my reps. This week I wanted them to be consistent (without the accidental speedy second rep we did last time). The course was a few metres longer this week but the times practically the same: 10.13, 10.08, 10.11, 10.12. Ian made me put in a fast finish on the last one. It was not fast, as we both discovered when we tried to kick on. I think this was mainly down to it being utterly freezing so our legs had frozen into the rep speed and couldn’t be coaxed out. I was very pleased with this session and thanks to Ian who took it upon himself to be my pacer for the evening. After Tuesday’s success I thought I’d better rest on Wednesday morning knowing I had the Arena tempo run in the evening. Steve had decided we’d do the course in reverse which meant I’d be passing near my house towards the end, thus I thought I’d split the run into sections, finishing at the lagoon as it seemed silly to run the last mile away from my house back to the end just to run back home again. Once we had cleared the narrow pavement bit by the King Alfred and reached the wide lawns section I decided to see how far I could get at a reasonable speed. The pier it turned out. The return section to the King Alfred was at a more steady pace, picking it up a little towards the end as I had turned into an ogre of a personal trainer to poor Rob (sorry). Once we had regrouped (and Rob had escaped) I knew I only had a mile to the lagoon so thought I’d put it in again. I sped off only to be outsped by Paul just before I reached the lagoon and slowed down for the final few hundred metres home. The speedy sections were at around 6.30 pace which I was surprised about. Must be the solid few months of proper training and lack of stressful, on-feet, no-lunch-break job. Whatever it is it is long overdue. The whole run was probably around 6 miles. On Thursday morning I was, unsurprisingly, totally knackered so dragged myself out for a very easy paced run. It was not easy. Headwind in both directions. A struggle. 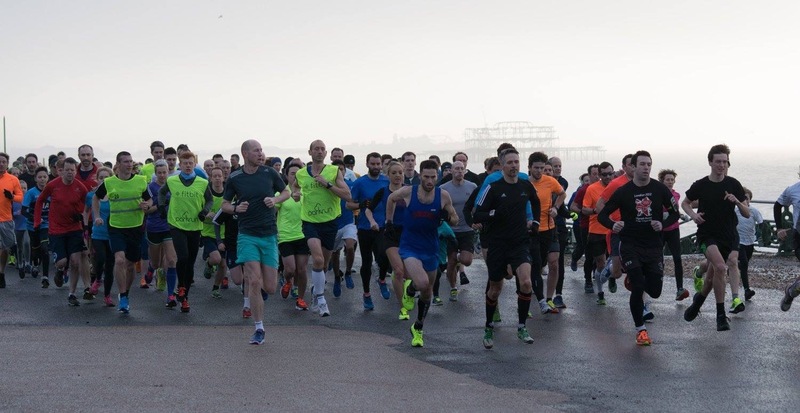 I didn’t go to Tom’s session in the evening as I wanted to be recovered ready for the Arena 80 Hove Prom parkrun takeover on Saturday where I was going to follow Alex and Andy, who were on 20 minute pacer duty, to the sub 20 I should be running but am not. The forecast for Saturday was foggy but not too cold and, most importantly, not windy. I felt ready to finally get back in the 19s. I donned a splendid purple themed running outfit. As I am insane in the membrane sometimes I need to be precisely colour coordinated. Also as I was intending to run faster than I have for ages I made sure I wasn’t overdressed as being too hot is a speed killer I find. Purple was the theme because I had new long socks (ski, not compression) to test and as it was Arena takeover week my volunteer t shirt to wear along with my favourite shoes which are purple. I kept my gloves though as they are useful for snot and sweat. After doing my duty as pace bib giver-outer I tracked down Alex and Andy to make sure I was with them from the first step as I knew I’d have to be to go properly sub 20. As always when being properly paced the first kilometre or so feels far too slow and easy but I knew soon enough it would feel hard. It did. Thankfully today I knew I would keep with the pace and apart from dropping to the back of our little group from time to time I never lost contact so was able to get back into the midst when I was feeling better. The pacing duo of Andy and Alex was excellent with them both checking how I was doing throughout (not sure who the rest of the group felt about this). As I wasn’t sure how much under 20 they were running I tried my utmost to keep with them in the home straight. Andy took to the front of the group and Alex came back to help me. I managed to get back with the group and even overtake a few of them in the final 100 metres or so. Still having a nagging doubt I’d run 20.04 or something equally disappointing I was very pleased when Alex said he’d got 19.48 for me. Phew! 12 seconds of official results discrepancy leeway. Rob managed to sneak a look at the time checker sheet where I was immortalised in ink at 19.48. Yeeeeeeeeeeeeeees! Thank you so much to Alex and Andy for their excellent pacing skills and encouragement. Now I must do it myself next time. Arena folk after the run. Gary arrived just in time for the photo. Thank you very much to Danny for allowing me to use your photos. Much appreciated. Last on the list. So the only way is up, right? To round off my successful and sensible week I went out on another easy paced LSR with Rob and his hoof sounding new ultras today (Sunday morning). 11 miles, to take the weekly total to a much more acceptable 41 miles. As I have a new job that is only afternoons I thought I’d try doing an easy run in the morning. Thus I did 4 easy miles to Hove Lawns and back. In the evening it was track as usual. 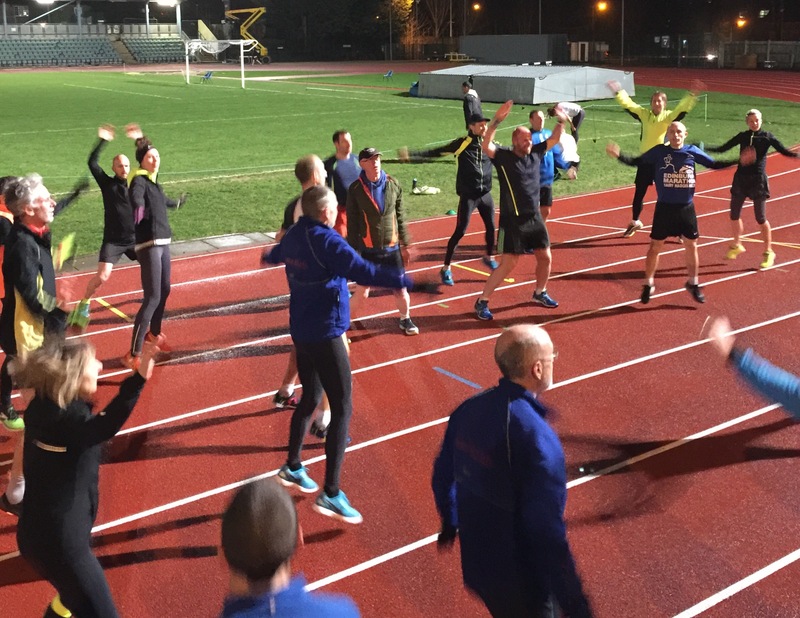 This week continued on the 700 theme but this time it was broken down into 300 tempo followed by 400 fast so quite a leap from last week’s 500/200 split. There were still 9 of the ruddy things. We shared out the pacing but as the group was bigger we only had to do one each. We averaged 2.45 so a few seconds faster than last week as would be expected with the shifted ratio of slow/fast. The first of the LSRs was done on Tuesday morning. A bit windy as usual. As Rob was recovering from a cold we just did the usual route at a sensible pace. In the evening: DISASTER. Tom had planned a six mile continuous hilly Hove Park course. I was looking forward to it as it’s definitely not something I’d do on my own. I set off with Tom and Ian as usual but then totally and utterly died after a mile or so. I don’t recall EVER having conked out so comprehensively. Totally ran out of fuel. My legs wouldn’t even move properly so I was reduced to a shuffle. Obviously I didn’t stop. When I finally finished about 100 years later (or so it felt – actually 53.06 for 6.7 miles) I had to sit on the wall. The edges of my vision had closed in and all I could see was Tom, Ian, David and Sean looming over me indistinctly asking if I was ok. I was not. Tom let me drink some of his water but no one had any food and I had my bike so couldn’t accept a lift home. The ride home was horrible as I still couldn’t see properly and kept almost keeling over. What a fool. Anyway it scared me so much I will NEVER not eat enough ever again (it was unintentional). In fact I’ve been stuffing myself silly ever since. After that disaster I decided not to do anything on Wednesday morning as I knew I had the Arena prom run to do in the evening. Naturally the weather was nice in the morning. Sunny and cold but not windy. By evening there was rain forecast. As I haven’t been to Wednesday evenings for a while I forgot there are different routes and this time it was the marina. I didn’t think I could handle the extra distance or any real speed after Tuesday so Steve suggested I do the slightly shorter route as it’s the same distance as the normal route so I did. Jodie joined me. The whole thing was still 8 miles including getting to and from the start and my average pace was around 7.30-7.45 so an acceptable run. The rain held off until the last mile or so, but that was plenty as it was freezing, sharp and accompanied by a fiercely cold headwind. Luckily Katherine was running with me so we managed to battle onwards. On Thursday Rob and I embarked on another LSR. I was a bit knackered after a hard week so far but managed the usual route at the usual pace. I saw sense and didn’t do Tom’s session in the evening. I fully rested on Friday. 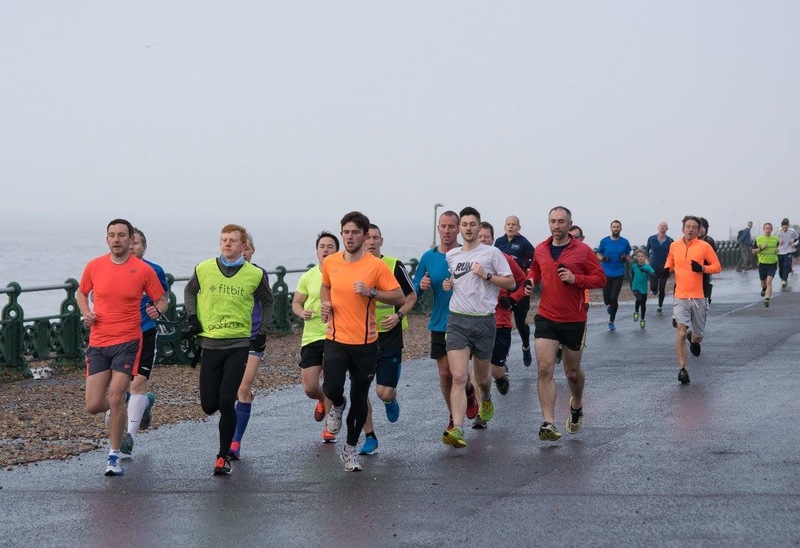 Finally, after many weeks of too awful weather, I made it to Hove Prom parkrun. It was utterly freezing. Even Caroline was wearing long sleeves and gloves. The prom itself was very icy/frosty which meant I had to develop an Al style shuffle to remain upright. It did help but I got a stitch due to the shoulders-in-ears situation. For once it wasn’t particularly windy but what wind there was was freezing. I thought the end of my nose was actually going to fall off. It did not. I was quite pleased with my run time of 20.52 given the conditions. This morning (Sunday) I joined Danny, Mike, Alex, Dorian and Rob on Danny’s long run. Rob and I joined Danny et al at Hove Lawns then we all proceeded to Shoreham Arm then back towards the Marina where they had started. Rob and I peeled off at Grand Avenue, then after a quick stop for parma violets, we continued our separate ways. I had only meant to do around 10 miles but once I got home I realised it was 13. This was fine though as I felt strong as I had had porridge before the run and had been scoffing for England since Tuesday (note to self: eating porridge within an hour of running means miles and miles of stitch). A rather too high 60 miles for the week. After slightly charring a tea light at both ends last week it was inevitable that I would catch a cold. It was still in the early stages on Monday so I took myself off to track in the hope of killing it, but not myself, off. The session was 9 x 700 with the last 200s a bit faster. We split into small groups to try and avoid congestion. I was with Rick, Jodie and a man whose name escapes me. We managed to get rid of the too fast Teo and Tristan into another group. Rick led off the first two to get us off to a good, consistently paced start. I chose to go next as my pacing skills are dubious at best. Rick taught me an excellent trick to pace the requisite 25s per 100m. Meow meow meow meow meow meow. This worked a treat. Thus the session passed and we averaged 2.49 per 700 which is around 4.10 per k which is FAR TOO SLOW but felt hard enough. On Tuesday it was back to business on the prom. The weather was still and not cold. This was very odd after all the horrible relentless wind and rain of late. I revelled in being overdressed and boiling. The route for the evening was a 2.5k loop on the prom and pavement. Tom said we should be doing between 10.15 – 10.30 per rep, around 10 mile race pace. I don’t work on paces like this being such an inconsistent racer and pacer so I just went with the usual crew of Tom, Ian and Sean. 10.06 for the first one. Two and a half minutes rest then off again for a 9.57! Yikes. Had I ruined it? No. Some dogs did on the next one but it was still 10.10. Then 10.13 for the last one so a perfectly acceptable set. Well duuuuuuuuuun. The cold was beginning to progress and after a good session on Tuesday I just wanted to do the Arena prom run as an easy 8 as I’d promised I’d go to help try and get the number of normal speed participants up. I managed a sort of fartlekkish run of slowish and fastest bits. 8 miles dans le sac. Due to a weather forecast that turned out to be incorrect I dragged my snot-filled self over to Hove Park on Thursday evening for Tom’s session of 6 x 800 (having failed to do anything of my own in the afternoon). Somehow I managed to be far too early and my reasons for not going to Tom’s Thursday’s Hove Park sessions became real as hundreds of Arenas ran back and forth past me as I locked up my bike and shamefully waited for the rest of the “other” group to arrive. The route was a hilly 800 which we did in alternate directions with a 2 minute break in between. 3.18, 3.09, 3.15, 3.08, 3.14, 3.04. The faster reps were the ones with a short sharp uphill start with a long flowing downhill. On one I had to stop for a black dog in the black night deciding to stand around my feet whilst its owners did nothing. Huff. However I was pleased with these reps as I was near enough Tom for all of them. 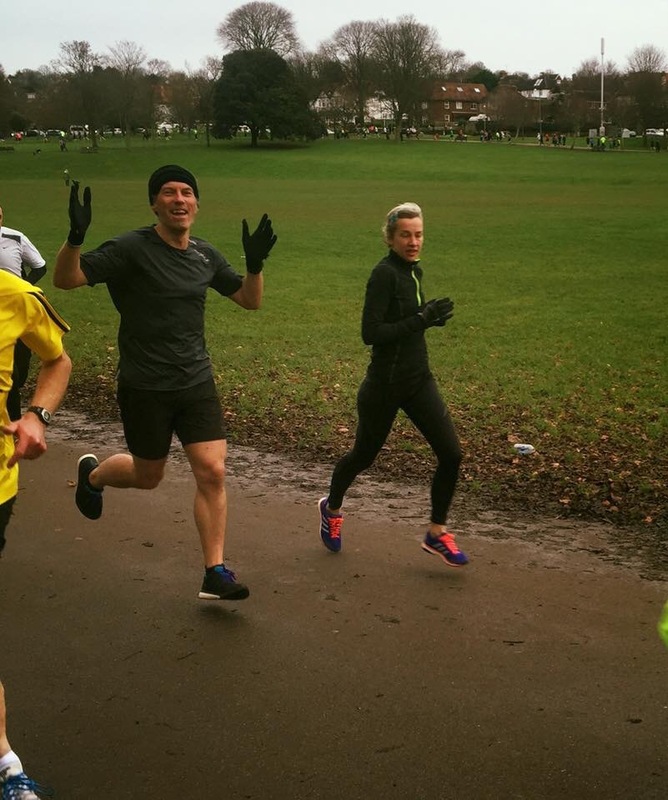 I had volunteered to run/scan at Preston Park parkrun on Saturday as the forecast had been grim but in the end it was I, rather than the weather, that was grim. However I dragged myself over thinking I could just scan or drop out then scan if I was incapable of running. Turned out I was ok after the first 500 metres or so and I rolled in in 21.05 which is near enough normal. There were many new year’s parkrunners so there was much scanning to be done. It was done. As was I. Stupid sinuses and sneezing ridiculousnesses. Somehow I managed 25 miles for the week but I’m sorely lacking long runs. Hopefully next week will be better. No track. Yes work. No running. Two days rest in a row. Blimey. Tom’s postponed Christmas handicap happened on Tuesday evening in the usual recent weather of wind wind wind. Not quite as disgusting as the week before that caused the postponement. We had all given Tom a guess (in my inconsistent case)/prediction as to our finishing time for 5k based on our most recent times plus a minute for weather, 180 degree turns, stony prom etc. Thus I said 22 minutes. Tom had obviously tweaked some predictions as after a few slower people had started a large posse of us set off on 21 minutes with just Tom a minute later to chase us all down. As is very occasionally the way I was running like I should always run. Fast, bouncy, easy. I was lucky to be flanked by Ian and Sean most of the way so I just stuck with them and as they pulled away in the last half a mile or so it was easy to just keep going and not drop them too much by the end. I was utterly staggered when I looked at my watch to see 20.14! Third fastest of the year I think and in very unconducive running conditions. Flabbergasted but extremely pleased. I was even properly third, having assumed I’d really be 4th once Tom’s extra minute handicap was taken into account. A good end to a not so good year (post the mega surprise that was the Brighton half marathon 1.29.06). On Wednesday I had promised to go to the Arena tempo run to try and entice some slightly slower-than-Steve type people to join. Alas I was still by far the slowest but Tristan ran with me thankfully as he was just trying to reach 100k for the month (I think?). The weather was an utter bag of rubbish yet again. Extremely windy and horizontal flaying-the-skin-off rain. I think having run fast the day before I was even feebler than usual and we were soon way off the back as the usuals sped on ahead. We probably still averaged around 7.30mm so it might not have been as slow as I feared but man was it unpleasant. I even developed flaming front of thigh disease when I got home. Red hot and itchy as heck. Blinking awful. I was at work on Thursday so didn’t run. Thank goodness. Then it was 2016. Which meant TWO PARKRUNS IN ONE DAY! Shame that day was freezing and windy. The first run was an ok 21.09. It was very windy and it turned into a fartlekky affair where I ran fast when I wanted and didn’t when I didn’t. It was then time to cycle over to Hove Park for the next instalment. 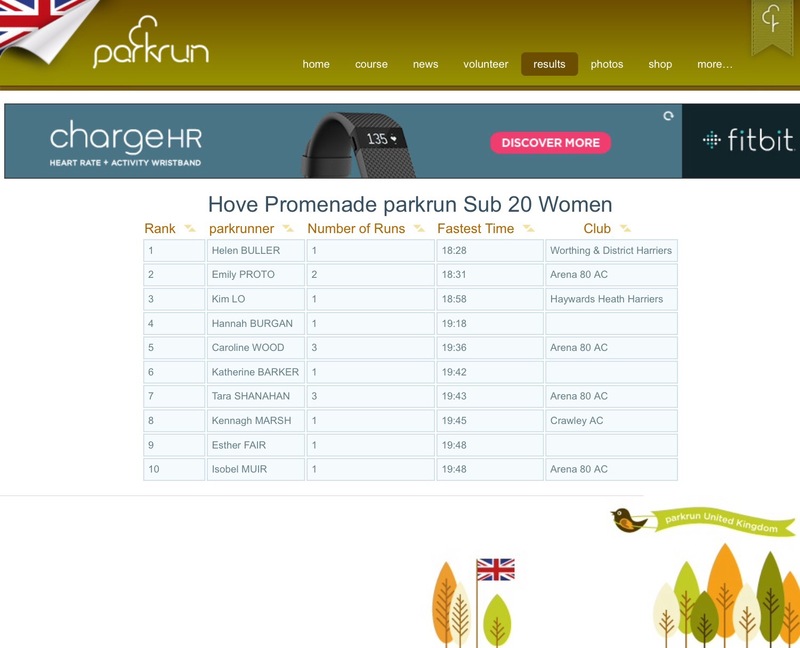 I hate Hove Park anyway and it was cold and stupid and I dragged my decaying form round in 22.06. I was quite surprised as I felt like it was much much slower than that. The it was really parkrunday. To complete the triple (and because the weather was once again hideously rainy and windy) I fought my way over to Preston Park against wind, rain and a woman driving on the wrong side of the road whilst looking at her phone. It turns out that running four 5ks in a week is knackering. I managed 21.35 but I felt like every single 5k muscle had died. A full week to the next one! Today I did nothing. I start a new job tomorrow and once I’ve settled in to the routine (ahhhhhhhh routine my sorely missed old friend) I hope to get back into proper running. Let’s go!